Midsummer, a neap tide and the promise of some sea breeze was the perfect cocktail for the Javelin Nationals held at Southwold Sailing Club on the weekend of 21st - 22nd June. 10 boats left the slipway on Saturday morning with a tricky day in prospect and a light South Westerly and ebb tide to take them out of the river to the course area set in Walberswick Bay. The first race started promptly at midday and the Glossop & District SC pairing of Richard and Kathryn Smith led the way, as the race team worked hard realigning the course with the oscillating breeze. The Smiths took the victory in a shortened race, ahead of Brian and David Earl in their new JJ boats, boat, with class builder James Jarvey and Andrea Penrose 3rd. After a brief postponement to reset the course, race 2 was started in a much steadier SSW breeze, but with plenty of shifts in near the beach as the fleet neared the windward mark. In a repeat of race 1, the Smiths won ahead of the Earls in 2nd and Jarvey/Penrose 3rd. Further back in the fleet local sailor Greg Brown helming for Geoff Brown sailed a good race to take 6th. Race 3 started with the course unchanged, but as the fleet reached the windward mark and set off on the reach out to the wing mark the wind swung through the 180 degrees, leaving the race committee with no option but to abandon and restart the race. The new breeze from the North was much steadier and had jumped a few notches on the beaufort scale providing the best conditions of the day. This time the Earl brothers found their speed and got away from the fleet to take the victory ahead of the Smiths. Arent de Jong who had flown over from Holland to compete, and John Meachen had their best result of the weekend, taking 3rd place. Further back there were a number of capsizes and retirements as the sea conditions became livelier. With special mention to Chris Skedge and Chris Clitheroe, more used to conditions on the River Yare at Buckenham, they recovered from a midrace capsize to take 7th. With racing complete for the day, the fleet retired to the clubhouse for refreshment, duly provided with draught beer from Adnams, a great chilli from The Lord Nelson and a sunset view that only a seat on the Sailing Club balcony can afford, leaving everyone prepared for another challenging day on Sunday. Many were expecting a postponement to wait for a seabreeze, but after a recce to check the course area, race Officer Cath Fox gave the order to launch and race 4 started with only a small delay in a light Northerly with the ebb tide providing a helping hand on the upwind leg. The pattern for the day was set as the Earl's showed superior speed in the conditions to take the win ahead of the Smiths, with Jarvey/Penrose 3rd and the series was all tied with 2 races to left sail. Just behind these 3, Katrin Deinhart and Olav Schlinter were finding conditions more to their liking, taking a 4th place and challenging the established order. After a small adjustment to the course, race 5 was started with the fleet piling in at the committee boat end to gain advantage and tack immediately into the stronger tide. The Earls once again pulled into a commanding lead, chased by the Smiths with plenty of place changing behind. This meant a final race showdown and a potential tie break for the National title, the Smiths won the battle for the committee boat end and tacked first closely pursued by the Earls, these two led at the windward mark and a luffing match ensued before they set off downwind, the Earls again showing superior speed in the conditions to pull through and then extend their lead upwind. As the Smiths gambled to try and close the gap Jarvey/Penrose pulled through to 2nd place for their best result of the weekend. Just behind Ben and Richard Fisher took 4th place, enough to give them 4th overall. At the prize giving, Cath Fox thanked the clubs committee and volunteers for their hard work before prizes and spot prizes were handed out. 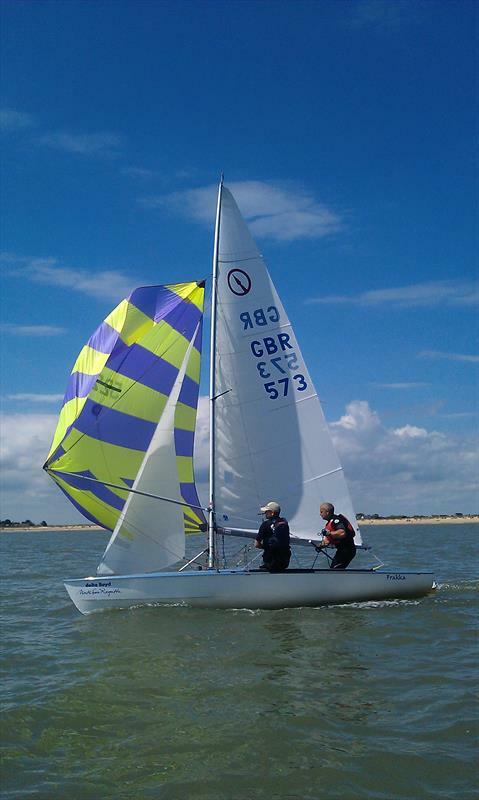 The Earls thanked the club and competitors for a great weekend and hoped the class would return to Southwold in 2015, while adding their pleasure at their new boat and the return of the National title to their trophy cabinet after a gap of a few years. 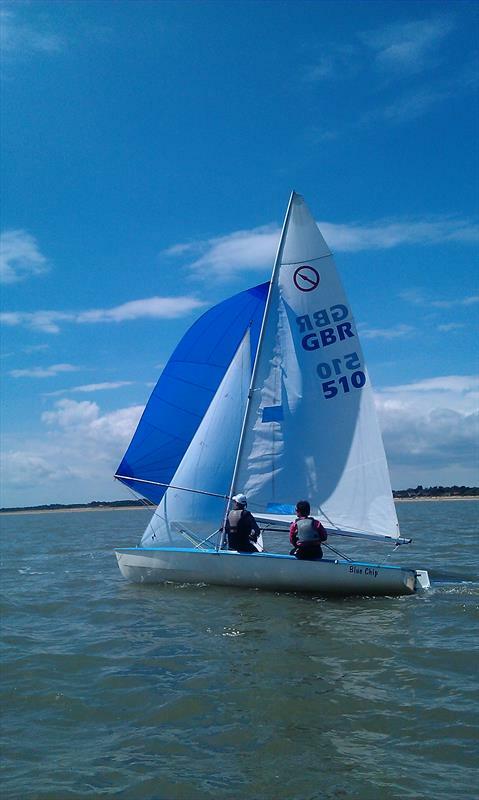 The fleet now move on to the European Championships in Germany, from 5th – 10th August.